As an opera-lover with a particular interest in the ways opera developed and proliferated over the centuries, I’ve sometimes dreamt of a world in which every important composer’s first opera was available to listen to. It’s a fantasy: first operas are seldom as good as later ones and the recording industry, quite naturally, tends to seek out the best, not the earliest. Nevertheless, to anyone like me, first operas always have an intrinsic fascination, for they mark the point at which a particular individual talent joins the larger tradition. They often have much to say about a young composer’s influences and aspirations as well as the standards and expectations of those for whom the opera is written. Johann Simon Mayr’s Saffo (1794) is a superlatively good and superlatively interesting first opera. Mayr wrote some seventy operas in the course of his three-decade operatic career and the vast majority have not been recorded, nor indeed performed since he enjoyed his final premiere in 1824. Franz Hauk’s decision to excavate the very first is thus both enterprising and unexpected, yet the results fully vindicate the project and the efforts of those involved. Saffo is revealed as an extraordinarily confident and masterful work with the composer’s mature personality already largely developed. A major reason for this, no doubt, is its comparative lateness: Mayr was already thirty when it received its premiere at the Teatro La Fenice, Venice. It is hard to think of any other important opera composer from this era, Beethoven always apart, who waited so long before seeing his work on stage. Cimarosa, the leading Italian opera composer when Mayr’s career commenced, composed fourteen operas before he was thirty; Rossini, the dominant presence at the end of Mayr’s career, managed over twice as many as that. Delay, in Mayr’s case, appears to have been all to the good. There is something very deliberate about Saffo, a work bearing none of the signs of haste and inexperience that mar so many composers’ first operas. It is carefully planned and beautifully composed with a strong feel for the dramatic potential inherent in Antonio Simeone Sografi’s fine libretto. Gluck was surely a powerful influence and it is easy to suppose that Mayr, a German, may have dreamed of being a second Gluck. A more immediate influence was no doubt Ferdinando Bertoni (1725-1813), Mayr’s teacher in Venice, who was himself influenced by Gluck – to the point where Gluck did not scruple quietly to ‘borrow’ some of Bertoni’s arias. Then there was the larger influence of the Venetian operatic world which had become a hotbed for experimentation with the forms of opera seria – with Paris in turmoil, there was surely no better city for a composer of Mayr’s originality to be making his debut. (The Naxos translation gives ‘Saffo ardisca!’ as ‘Saffo bears it’, which is surely an unfortunate mistake.) This winds the emotional situation up to a higher pitch. Saffo, with some encouragement from the Pythia, believes she should commit suicide by undertaking the famous Leucadian leap. However, at the last moment the tragedy is averted by Faone, encouraged by Alceo, showing some sympathy for Saffo’s sufferings. I must say this ending came as a complete surprise, and not a welcome one. It has the sort of tacked-on happy ending quality found in so many earlier opere serie — and beautifully sent up in The Beggar’s Opera — but this was certainly not a requirement in Venetian operas of the 1790s. I was taking it for granted that the opera would end with Saffo’s spectacular suicide, in the manner of Giovanni Pacini’s much more famous Saffo of 1840. Interestingly, another Sappho opera of 1794, Jean Paul Égide Martini’s Sapho, did end tragically. The general dramatic movement of Mayr’s opera seems to be towards tragedy, and the sombre colouring of his music prepares one for it. Perhaps, for some reason, he was not allowed to compose the ending he would himself have chosen. This was my only disappointment with this really exciting release. At no point does Mayr’s score sound routine or turgid, nor is there any of the fluff and padding that make so many eighteenth-century operas much longer than they need be. His recitative is incisively dramatic; his arias strongly shaped, brief and to the point; his choruses noble; his use of the orchestra colourful and inventive. One feels throughout that the subject and libretto were very congenial to Mayr, allowing him to play to his strengths in the alternation of grand ceremonial scenes with the emotionally-fraught conflicts between, and within, the three principal characters. In his 1989 book on Mayr, John Stewart Allitt refers to Saffo briefly as ‘a block-buster of an opera’. He does not elaborate on his grounds for that judgement, but now the evidence is here, such an accolade seems fully justified. The Naxos studio recording is bright and forward to the point of occasionally being a little claustrophobic, but there is something gripping about its immediacy. Franz Hauk, who has done so much for Mayr (see below) and is surely the greatest living authority on the composer, conducts with authority and panache. The singers are uniformly impressive, with the principals entering into the drama of the opera rather than just singing beautifully. What’s not to like? Well, you have to download the libretto, which always annoys me, but I haven’t enjoyed a first opera so much for a long time, nor felt so enlightened by the experience of listening to one. 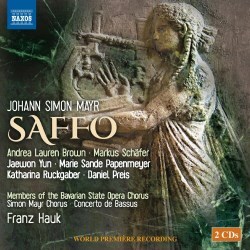 Saffo will be an essential acquisition for anyone who loves Mayr’s music and, at Naxos prices, it should prove very attractive to anyone interested in the way opera developed in the crucial period after the French Revolution and Mozart’s death.